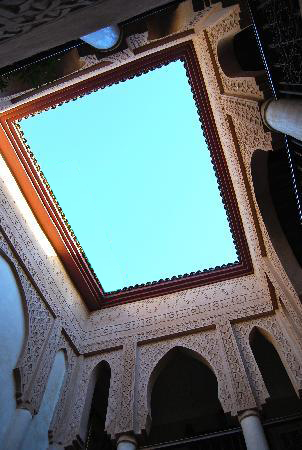 Up on the roof "Just Drifting"
So, you’ve decided to visit Marrakech and now you’re wondering where to stay. When we started on the same journey, we were looking for somewhere that would be part of the experience, not fastened on to the side of it. 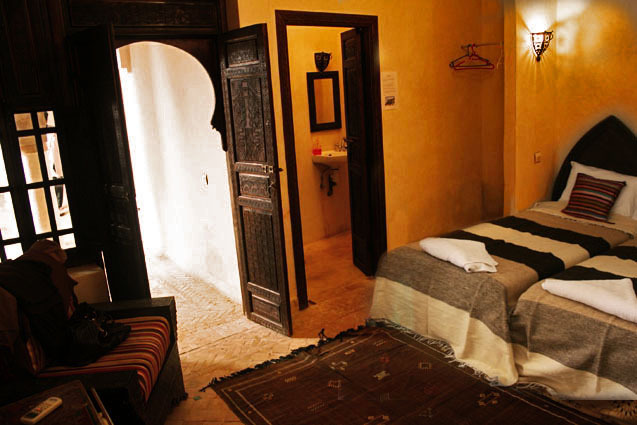 For that reason, we searched in the Medina and Kasbah and there, under an unassuming pin on Google Earth, was this astonishing find – a Riad with a location in the heart of the Kasbah, easy to find and within holiday walking distance of history and breathtaking visual stimulation. Better still, it turned out to be owned by someone who has adopted the whole Marrakech experience and channelled all his experience and enthusiasm into facilitating the same for others. Riad Laksiba turned out to be a delight. It is a traditionally and thoughtfully restored building that looks unassuming on approach but, from the minute you step across the threshold, reveals hidden depths. Cool and refreshing in the heat, cocooned and protected even through rainstorms (and there were one or two when we were there). The private accommodation is simple and comfortable, clean, with plenty of space, crisp cotton sheets, authentic decoration, tiling and lighting plus ample hot water from a wet-room shower – always a good sign. The rooms are arranged around and looking in to the central court, on the ground and first floor; up on the roof, it’s possible to look down into the atrium and see reflections of sky in the splash pool below. The ample circulation area on each level has seating where breakfast is served and lounging, reading, just staring into space or communing with the resident chameleon, Karma, all takes place. Karma "sees all and knows....."
One thing that you won’t see quantified anywhere, and it does slightly defy description, is the sense of community that has been created by – by what? the architecture? the care of the owners and staff? I don’t know, but it’s sort of like living in a family but without any of the annoying necessity of having to communicate with anyone if you don’t want to. There are five rooms, all with their own en suite facilities, a roof terrace with sun loungers that are brought out on request, four seating areas for between two and four people around, or overlooking, the splash pool and a kitchen/office on the ground floor. Plenty of opportunity to keep yourself to yourself. But if you do want to interact with your fellow guests, it’s somehow possible to be close at a distance – I’m not entirely sure that makes sense, but it will if you’ve been there. “This sense of community was brought into sharp focus as a result of the Argana incident during our stay, each of us separately worried for the others and a huge sense of relief when everyone turned up safely at the end of the day”. Ah, now, breakfast – a word that doesn’t do justice to what is put before you. Touria, who prepared delicious beghrir (Moroccan pancakes made from semolina flour and bubbles, so far as I could see), msemen (pan-fried dough which is folded into a square shape), or natural yoghurt and fresh fruit with honey was keen to make sure that we had what we liked and though the fare was varied every day, always willing to take account of individual taste. Oh, and the fresh orange juice – if there is one defining and outstanding feature of breakfast at Riad Laksiba, it is the quantities of this nectar that were available every morning. We left on our daily adventures well fortified. What else can I tell you? The front door is next to a socking great date palm and opposite the entrance to a structure where, if you time it right, you can see through the open doors to the horses, the same ones that draw the carriages that are available for hire, as they are stabled for the night. You can also often see an empty carriage outside, covered and directionless, standing waiting for the morning when it will have life and purpose once more. 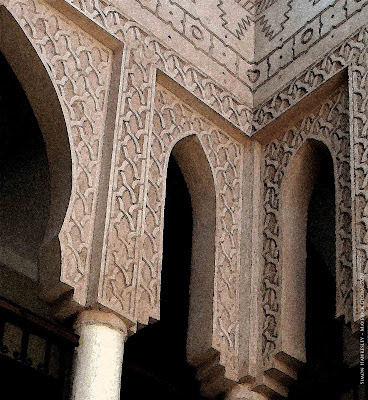 The walking routes from Riad Laksiba through the Kasbah in the Medina and beyond are easily navigated and it has what must be the most remarkable views to be seen on a stroll to the supermarket anywhere on the planet. I mentioned Touria earlier and it would be disgraceful if I didn’t also mention Abdelhamid and Abdou. Abdelhamid’s first degree is in the study of the English language and he deploys it most effectively in ensuring that guests are happy and at ease. 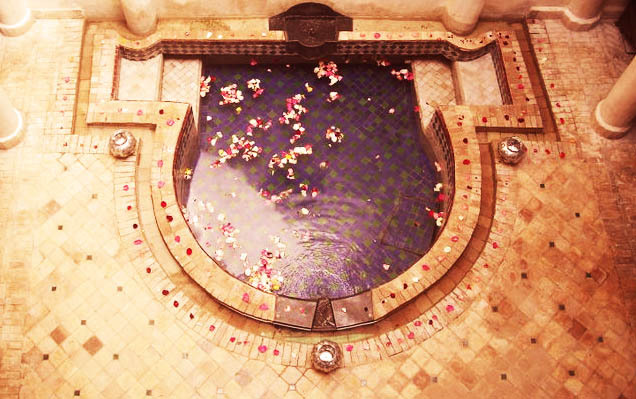 He and Abdou look after everyone with self-effacing, friendly courtesy, care and attentiveness – you’ll never need to ask for mint tea, it will just appear at your side as if by magic and rose petals seemingly scatter themselves in the splash pool every day. Together, they are a perfect combination that it would be difficult to improve. 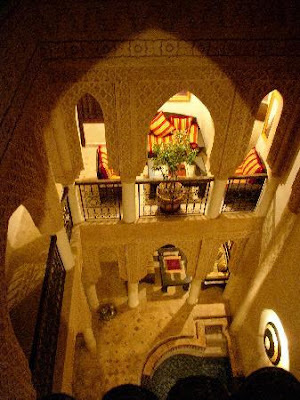 Quite honestly, we could have just stayed in the four walls of the Riad and had a relaxing and thoroughly enjoyable time. But then, that’s not why you go to Marrakech, is it? 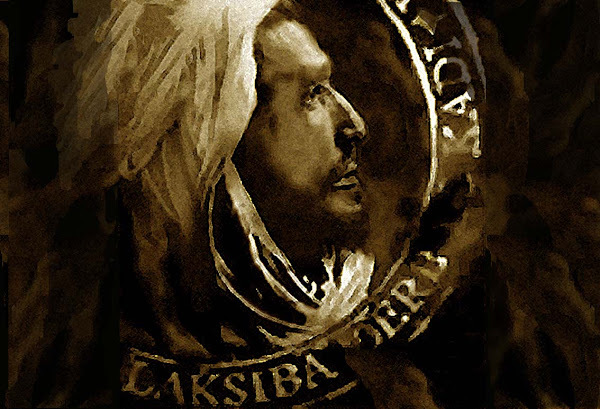 Riad Laksiba is offering a sepcial “Soft-Launch Promotion 2011” . £25/per/person/night/including Breakfast. Please CONTACT US with dates and number of guest(s) to see if we have availability. Please send this Article to your Friends, fellow Twitters Facebookers etc. Let them enjoy this special offer.